This group dates from 1959, and carries several original tags. All pieces are stamped with original production dates. The chairs have been lightly restored, and are now in excellent condition (see photos). 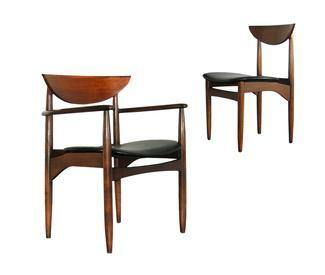 The four chairs are in original black upholstery cover, and the �head of table� chair is an arm chair. This is a highly authentic example of American Design of the 50s and 60s, proudly made in the USA. Walnut veneer over hardwood solids, hardwood legs. It's likely that the solids and legs are maple.